Paddy rice is a more or less unknown sort of food for small pet birds such as budgies even though many of these animals like this food. Since paddy rice is quite large and the seeds are very firm, most small birds are unable to eat dry paddy rice. 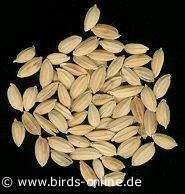 But if you use paddy rice as an ingredient of your seed mixture for sprouting, the birds will be able to eat the seeds and their seedlings. But make shure that you add only about 1% of paddy rice to the seed mixture to prevent an unbalanced diet. Birds who eat too much rice are in danger of showing a lack of vitamins and other nutrients on the long run.